Canning Beets is a great way to preserve your homegrown beets. They are a great side dish. You can warm them up or just eat them straight out of the bottle. 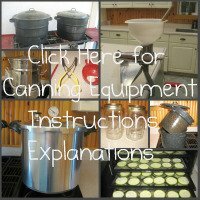 This Canning Equipment link has instructions and explanations about basic canning tools. Wash and rinse your bottles, lids, and rings with hot soapy water. Click here for detailed instructions on preparing your canning jars, rings, and lids. 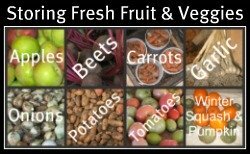 Harvest your beets when they are about the size of a peach. 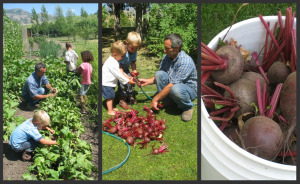 Smaller beets are more tender and sweet, but you get more food out of the larger beets. The larger beets still taste great. Cut off the green beet tops, leaving a two-inch stem. This helps hold the nutrition in the beets while they are being boiled. Wash the dirt and mud off your beets. You don’t need to scrub them because you will be peeling off the skins. Boil your Beets for about 10-15 minutes or until the skins are soft enough to slip off. The skins should just slip off, but if you didn't let the beets boil long enough just use a small paring knife to scrape off the beet skins. Put 1 teaspoon of plain salt in each quart jar. Put ½ teaspoon in each pint jar. Cut your beets. You can leave them whole, slice them into rings, cut them into cubes, or make whatever shape you want. It doesn’t matter as long as they are small enough to fit in the jar. Pour hot water into each jar covering the beets. Leave a one-inch head-space (space between the water and the rim of the jar). Put the lid on and screw the ring down. Do not over tighten, but make sure it’s snug. 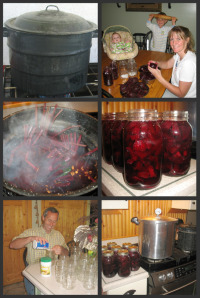 A pressure canner must be used when canning beets because beets are low in acid. Pressure Cooking for Beginners has simple step-by-step instructions to help you successfully use a pressure canner to can your beets. Pressure cook quart jars of beets for 35 minutes & pint jars of beets for 30 minutes. The pounds of pressure depends upon your altitude. See Altitude Adjustment Table. The next step is to check if your lids sealed. How do I know if my lids sealed?